If you are a regular reader of my blog (and why wouldn't you be? ), you already know that I don't travel on the Fourth of July. Even though I globe-trot for a living, it is the one week of the year that is just a little too nutty for me. Between the traffic jams, delays at the airport, and crowded attractions, I feel less like celebrating independence, and more like putting my fist through something. I guess I could find a timeshare rental close to home, and enjoy some rest and relaxation there. But I typically just putter around the yard, go to a parade, have a cookout, take in some fireworks, and generally appreciate the freedoms I enjoy as a citizen of this great country. But in the last few years, I must admit, I have developed what can only be described as an "unhealthy" obsession with the annual Nathan's hot dog eating contest in Coney Island, NY. Do you know about this thing? 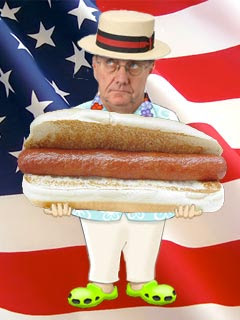 Every year on the Fourth of July, a contest is held to see who can consume the most hot dogs (and buns) inside of ten minutes. The event is said to trace its origins to 1916, as a means to settle a dispute between two recent immigrants as to which was the more patriotic. Nathan's now-famous hot dog stand was nearby, and the contest has been held there ever since. What the hell devouring more hot dogs than the other guy has to do with patriotism I'll never know, but they managed to settle the dispute without fisticuffs, and I now have this great spectacle to look forward to every year. This year's champion, Joey "Jaws" Chestnut, took the top prize by consuming 62 dogs and buns, while Sonya "The Black Widow" Thomas took home the first-ever women's title with 41. That's some seriously nice gluttony right there folks, and really should be the end of the story. But for me it is not, and is where my interest in this event becomes troublesome. You see, there was one competitor not present at the event who should have been. His name is Takeru Kobayashi, and from 2001 to 2006 he took 1st prize in the Nathan's contest, shattering previously held records. Prior to his emergence, the world record was 25. In his rookie appearance he ate 50, and by 2006 had pushed the record up to 53 3/4. He also pushed the competition to pick up their game if they ever wanted to see the winner's podium again. A young Joey Chestnut heard the call and in 2007 beat Kobayashi, setting a new mind-boggling record of 63 to boot. Chestnut went on to best him in 2008 & 2009 and up his record of 68. So this thing was shaping up to be an epic struggle between the two greatest human garbage-disposers in history. And then it ended. Kobayashi was banned from the 2010 event and has not competed since. You see, he is in a contract dispute with International Federation of Competitive Eating (IFOCE), who sanctions the event, and Major League Eating (MLE), to which all of the competitors must belong. You can't make this stuff up folks. Kobayashi, like many of the other competitors, does not limit his gorging to just frankfurters. No, he holds numerous world eating records including hamburgers, vegetarian dumplings, lobster rolls, and roasted pork buns, whatever they are. He once ate 17.7 pounds of cow brains in just 15 minutes, which is not only disgusting, but what has run him afoul of the IFOCE. You see, they do not want their competitors to participate in non-IFOCE sanctioned events. Yet they do not sanction any cow brains or rice ball events of their own. So Kobayashi ignores their restrictions and competes (and wins) anyway. This resulted in his removal - and arrest for unwelcome appearance on stage - at the 2010 Nathan's event. This year he chose instead to hold a simultaneous event at a nearby NYC location where he consumed 69 dogs and buns. And while this would be a world record had it occurred a few miles away in Coney Island, it will go unrecognized. And that, in my view, is just a pity. What would Ali have been without Frazier, Magic without Bird, the Yankees without the Dodgers? How could you have a golf championship without Tiger? You simply cannot refuse the world the chance to see these two go head-to-head in a mano-a-mano, winner-take-all gluttonfest. And even though I am fully aware that millions of people go hungry every day as these two stuff their faces, I cannot get past the sense of injustice I feel as a devoted fan of this "sport". I seriously gotta get some help.